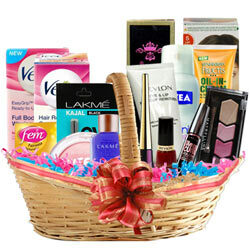 Let others feel happy as you deliver them this Crafty Gear Up for New Day Gift Basket with your love and affection. This Gift Hamper is beautifully embraced with FEM Creme Bleach - Golden Glow (26.4 gm), Maybelline Cheeky Glow Blush - Peachy Sweetie (7 gm), Lakme Eyeconic Kajal - Black (0.35 gm), Lakme 9 To 5 - Black Impact Liner (3.5 ml), Maybelline Volume Express Hypercurl Mascara - Waterproof (9.2 ml), Maybelline Diamond Glow Eye Shadow Quads Shade - Wine Pink (2.5 gm), Revlon Eye N Lip Makeup Remover (100 ml), Veet Full Body Waxing Kit - Normal Skin (Shea Butter and Berries) (20 pcs), Veet Hair Removal Cream - Brightening Sensitive Skin (60 gm), Lakme Nail Color Remover (27 ml), Revlon Nail Enamel - Red Spark 318 (10 ml), Fogg Fragrant Body Spray For Women- Blossom (120 ml), Nivea Deodorant - Whitening Smooth Skin (For Women) (150 ml Tin), Garnier Color Naturals - Light Brown No. - 5 (60 ml), Pantene pro v oil replacement gel 80ml. in a Basket.